type of hangover — the one you don’t deserve. 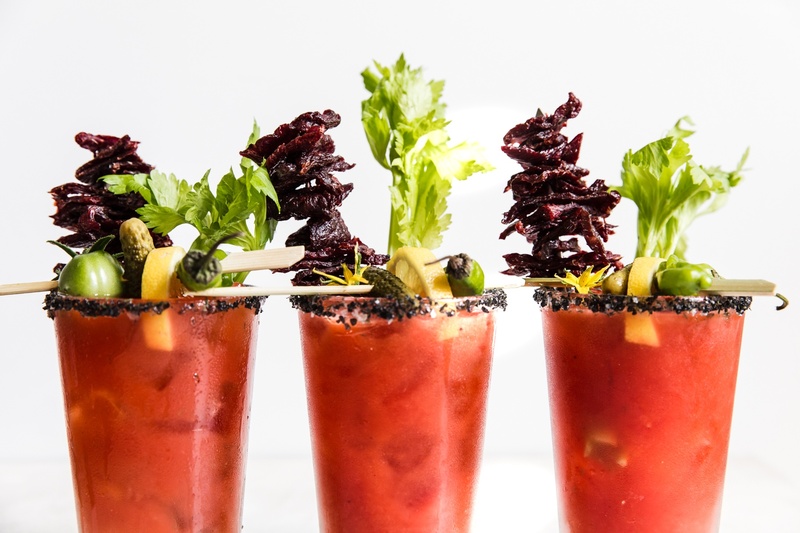 This pepper-infused vodka and Wagyu- jerky garnished cocktail is the perfect concoction for returning to a pre-prandial, pre-Monday state. You don’t even have to drink it in the morning (we won’t tell.) Cheers. Monday will soon be a distant memory. Place the sliced jalapeño in a jar along with the vodka. Store in the refrigerator for 24 hours. Strain out the jalapeño. Rim 6 pint glasses with the lemon wedge followed by a mixture of black salt and dill. Fill with ice. Fill a cocktail shaker with ice. Add the vodka, tomato juice, lemon juice, Worcestershire, black pepper, dill and salt to the shaker. Pour the cocktail into the salt rimmed pint glass filled with ice. Garnish with a skewer of beef jerky, celery stalk, pickles and cherry tomatoes.